A powerful but subtly rendered novel about the choices people make when there seem to be no choices. The latest from Britain’s Crace (Genesis, 2003, etc.) will likely draw comparison with Cormac McCarthy’s The Road, as both concern love’s salvation in a ravaged world on the brink of extinction. 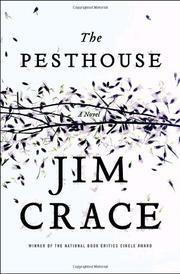 Crace sets his plot within an earlier stage of an American apocalypse, a time when most of the assurances of civilization within society have disappeared, even as there remains widespread hope of escape. Whereas pilgrims and pioneers once headed west for a better life, across the ocean to a New World and then across the country in the spirit of Manifest Destiny, the tide of history has now shifted back east. With America having reverted to a lawless, pre-industrial state, its cities and industries gone and its landscape largely a cesspool of environmental poison, rumors float throughout the sparsely populated countryside that ships will carry anyone who dares an arduous journey to a better world across the ocean. Among those attempting the pilgrimage are Jackson Lopez and his younger brother Franklin, both giants compared to most of their countrymen. The brothers find their journey to the coast stalled when Franklin starts limping near the settlement of Ferrytown. While Jackson searches for food, Franklin stumbles upon the titular “Pesthouse,” where one of the community’s daughters has been quarantined with “the flux,” a plague that threatens to kill anyone who comes in contact with it. All this may sound grim, but Crace more than once refers to his story as a “fairy tale,” and the relationship that the beautiful, innocent Margaret develops with the younger, equally innocent Franklin anticipates what must pass in this desolate world for a happy ending. Issues of family (blood or formed), religious faith, fate and the refusal to submit to it enrich an engrossing novel that may be the richest and most ambitious of the renowned author’s career. A novel that finds redemptive possibility where going forward, going backward and staying put seem equally perilous.